Decorated with warm colors and a mix of rustic and contemporary elegance, each of our three unique bedroom suites is generously furnished for your comfort and relaxation. 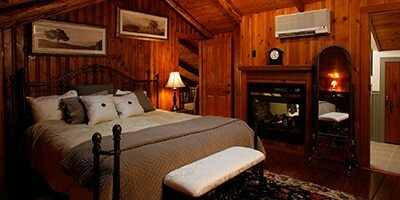 Each room features a king-sized bed with sumptuous bedding, reading desk, gas fireplace, and cable television with DVD/CD player. A refrigerator, microwave, and individual serving coffee/tea maker are provided for your convenience. Individually climate controlled, each room features air conditioning for summer, individual zoned thermostats in the winter and fireplaces to add that special warm and cozy touch. The spacious private baths in each suite feature large soaking tubs, walk-in showers for two, and towel warmers. Wireless internet, remote printing, and fax are available to all guests. If you have a special request, please contact us and we will do our best to accommodate your needs. Stately and elegant, it features a king-sized bed covered with a sumptuous paisley duvet, leather chairs in front of a 3-sided bay gas fireplace, and a spacious sitting area with a pullout queen sofa for an extra guest or two. In addition, it has a kitchenette area and a private bath featuring a Victorian soaking tub and a separate walk-in shower with body spray. Done in shades of green, gold, and wood tones, it features a king-sized bed with a sunset colored quilt, a cozy sitting area, and a two-sided, see-through fireplace between the bedroom and private bath. A large Victorian soaking tub and a separate walk-in shower with body spray are featured in the spacious bath. Decorated in antique whites and blues in harmony with the natural wood, this casual and elegant suite has a large entry area with a kitchenette that leads to the bedroom containing a king-sized bed with cozy duvet and deep blue throw quilt. It also features a cast iron gas stove, private sitting area, and private bath with combination soaking tub and shower offering a duo shower system with sprayer and rain shower head. Awarded #6 Best B&B in the USA! Copyright © 2019 Chalet of Canandaigua. Powered by WordPress. Theme: Spacious by ThemeGrill.